Thank-you for your latest marketing e-mail. It does a very good job of making the new MacBook into a tempting proposition. The thing is, I’ve already got one. You must be aware of this, because I had to register it with you when I first switched it on! It’s a lovely thing, but I have absolutely no need for another one. It sounds like you’re struggling keep up with demand anyway. Instead, why not try a different approach: Try and sell me something I might actually buy. Seeing as my Sony Walkman is presently all but useless with a Mac, persuade me to try an iPod. Hey, if I’m into music, maybe a decent set of speakers is in order, or an external hard drive to hold it all? You never know, perhaps I’d be up for buying some software to use on this thing – are there any good driving games on this platform? But please, stop trying to sell me what you’ve already sold me. So I went to see the fracture clinic today. I explained to the doctor how it happened, obviously telling the whole story, because I’m starting to feel a bit silly every time I say “I fell off my mountain bike“. He took a look at the x-rays and frowned. “Hmmm” he said, before going to get the other doctor. Ooooh-kaaay then. What the hell does that mean? I’ll just sit here and worry for a while then. Later on, at work, Maxine commented that it looked rather festive. Maybe I should have asked for red? Well, my busted hand didn’t seem to be getting any better, so I took a trip down to casualty to see what they thought. Obviously I was armed with stories from friends along the lines of Oh, there isn’t much they can do, they’ll just strap your fingers together or something . Some hours later, I emerged with a cast from my fingers most of the way up to my elbow. Great. Still, the break looked ace on the x-ray. I’ve snapped the outermost metacarpal (I think) good and proper. Nick fell off his Orange 222 in a big way within thirty seconds of starting his first ride out here a week or so ago. He broke nearly every major part of his bike and he’s covered in scabs and bruises, but at least he’s out there riding. Gary fell off his Orange 224 while riding the Mega Avalanche, busting a rib. He can’t sneeze, cough or laugh, let alone ride his bike. Anton re-opened a large wound in his leg whilst riding his Orange 224 into a tree somewhere near the Super-Morzine on Tuesday. 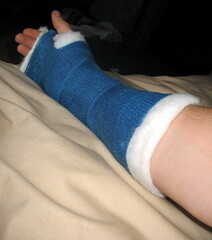 Charlie fell off his Orange 222 on the way back from Chatel on Wednesday. He went down hard on his front, before bike came down square across his shoulders, doing in his clavicles. He’s on his second day off the bike. Literally two minutes after he got back up, I fell off my Orange 222 in a big way (trying to overtake him) and busted my right hand. Simon told me that was the biggest crash I’ve seen in a long, long time . I too am on my second day off. It’s feeling a bit better today though. Of course, everybody else in the group is still in one piece. It’s quite clearly because they’re riding Santa Cruz, Mr Big, Ancilotti and Intense bikes. My theory is completed by Mr Steve Peat, who fell off of his Orange 224 on the last corner of his World Championship run two years ago. At the time, he was a good couple of seconds ahead of the eventual winner, Fabien Barel. Where was this? Why, it was just up the road at Les Gets. You are currently browsing the Think Drastic weblog archives for August, 2006.